Well, it’s nearly the end of the month. What does that mean? The deadline for a whole string of projects, not least of them being the enormous British dinosaurs review MS that Dave and I are currently bashing out. As of right now it’s 52 pp, and that’s without figures and tables. There’s also the Crato Fm turtles MS, the deadline for which is also the end of the month. Then there’s the British big cats talk, which is being given in the first week of February (more on that when it happens). 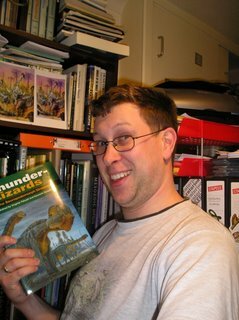 Then there’s book reviews: I have to have one written on Carpenter & Tidwell’s Thunder Lizards within the next few weeks, and for your enjoyment here is a photo of me with a copy I was kindly provided by Mike P. Taylor. You’ll note that it’s clearly not a review copy, as it’s been used. Then there’s the phd thesis, but the less said about that the better. Work continues with Barbara Sanchez-Hernandez and Mike Benton on new vertebrate fossils from Galve, Spain (loads of cool stuff there, but can’t talk about it yet), new Brazilian pterosaur specimens, and Wealden sauropods. At some stage Matt Wedel and I will get around to finishing a collaborative project. Richard Muirhead phoned last night to talk about stuff. Apparently the next issue of Animals & Men is out soon, but whether it’ll include a certain controversial article of mine remains to be seen. Steve Sweetman also phoned, and we spoke about Akidolestes cifelli and spalacotheroid biogeography, though, again, the less said about that the better at the moment. I’ve also recently been contacted by Dennis Stokes of the Botley and Curdridge Local History Society. He’s producing an article on the Curbridge (note: not Curdridge) whale: a Risso’s dolphin Grampus griseus that swam up Botley Creek in 1932, got trapped, and was then caught in a net, dragged ashore, and bludgeoned to death. Which of course is timely in view of the Northern bottle-nosed whale Hyperoodon ampullatus that just swam up the Thames. I published on the Curbridge whale in 1997 after seeing a photo of it on a pub wall – I thought it was most likely a Risso’s dolphin (and not a narwhal as was claimed at the time) and later found out that F. C. Fraser, great cetologist of the NHM, had identified it as such in an obscure little article (Anon. 1932). Who discovered that article? …………. Muirhead. Anon. 1932. Dolphin in Hampshire brook. The Fishing Gazette 20-8-1932, 217.